On May 8th, the Massachusetts Institute of Technology will host a special event to mark the release of the report The Anchor Mission: Leveraging the Power of Anchor Institutions to Build Community Wealth, featuring The Democracy Collaborative’s Executive Director Ted Howard. The report is an extensive case study of University Hospitals' Vision 2010 initiative in Cleveland, Ohio, and demonstrates how a place-based anchor institution can commit itself to conducting business in a way that benefits its surrounding community. Already, much work has been done to encourage connections between corporations and community and to show that doing so also generates a competitive business advantage. For some time, businesses have contributed to their communities through corporate social responsibility (CSR) programs that allow them to incorporate values beyond simply increasing profits into their operations. 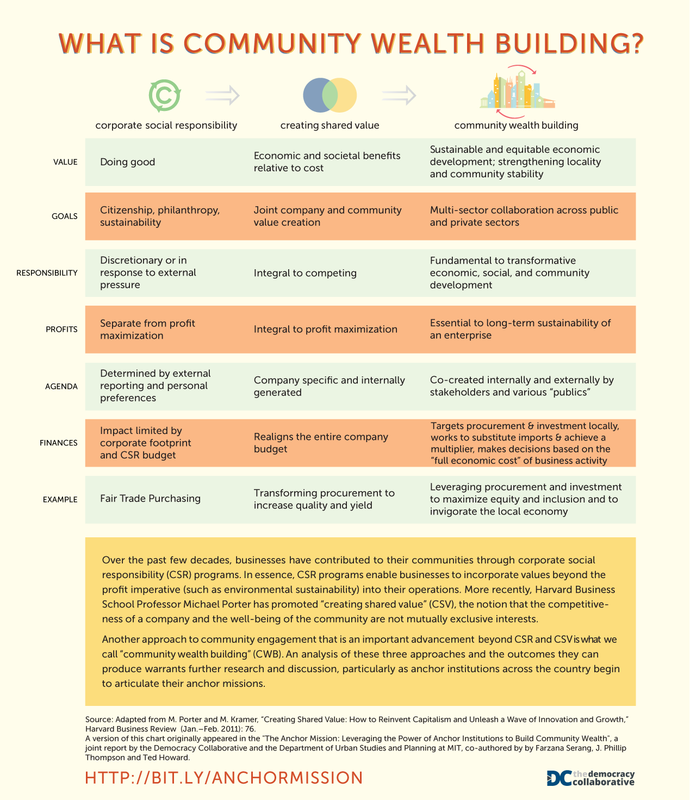 More recently, Michael Porter of Harvard’s Business School has championed the Creating Shared Value (CSV) concept, arguing that a corporation’s competitive advantage and the well-being of the community are not mutually exclusive. The example of UH’s Vision 2010 presents another approach to connecting business to community — one that extends beyond CSR and CSV to build wealth for disinvested communities. The community wealth building (CWB) approach promotes institutional commitment to sustainable and equitable economic development that results in greater community stability and wellbeing. Among the many positive outcomes of this approach, the institution benefits through greater community support, reduced costs (both financial and environmental) from directing procurement locally, and a more resilient and customized supply chain. The community benefits through the creation of new jobs, increased local capacity, and empowerment as a stakeholder in the development process. To find out more, be sure to read the full report, or attend the upcoming event or take a look at a second Democracy Collaborative report, Hospitals Building Healthier Communities, which further examines the argument in favor of the anchor mission and provides additional case studies of hospitals that are beginning to embrace community engagement and economic development strategies outside their institutions’ walls.